Mutual inclusion of the diversity in our human resources is a driving force behind sustained growth. ■ We promote the development of a workplace environment and corporate culture of mutual respect for diversity in terms of gender, age, nationality, race, ethnicity, religion, social standing, disabilities, sexual orientation and gender identify, values, approach to work and so on, in which employees can contribute and grow together. ■ We want each employee to work with vitality and excitement, demonstrating their full abilities as professionals. ■ Moreover, we want employees to take part in the management of their own organizations and demonstrate teamwork to bring about innovation and create new value. 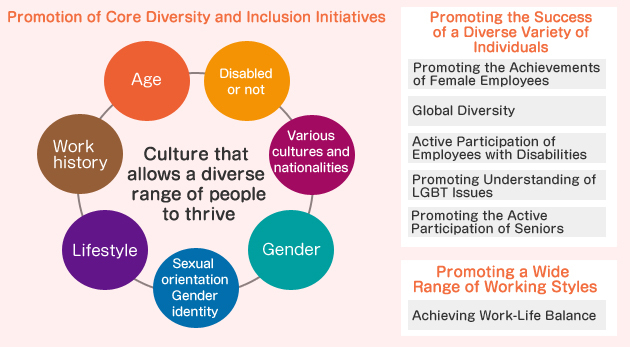 These concepts represent the diversity and inclusion approach embraced by the Dai-ichi Life Group.